I discovered Mujaddara probably about ten years ago at this little Lebanese lunch spot in Baton Rouge, called Serop’s Express. I didn’t know what the brown crumbly mixture was, but I ordered on a whim and I was instantly in love. The soft grain-like mixture was earthy, flavorful, and had an intoxicating blend of seasoning. I immediately googled the recipe, determined to make it myself. Despite trying several times over the past ten years, I’ve never been able to replicate Serop’s magic recipe. I’ve even had friends question members of the restaurant’s family about what’s in the dish, only to get the answer “rice and lentils”. *sigh* I’ve had mujaddara at other Lebanese restaurants, but none of them compare to what Serop’s serves up. I don’t know what they put in there, but it’s way more delicious and intoxicating than just rice and lentils. So, what is Mujaddara? It’s a recipe as old as time. 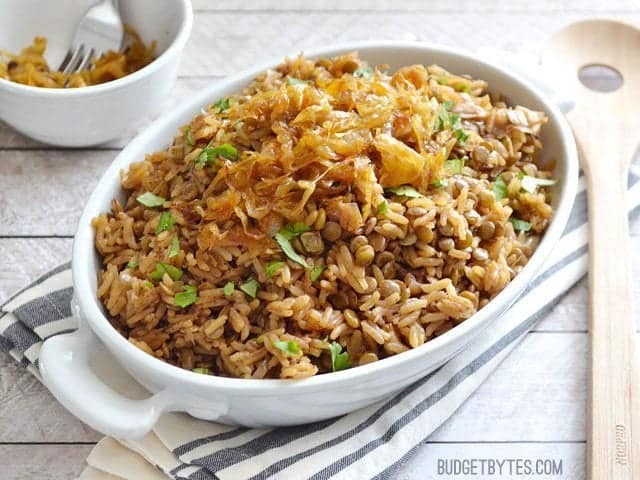 As with most recipes this old, there are a million and one ways to make it, but the common thread among them all is rice, lentils, and caramelized onions. Some are seasoned, some are not. Some cook the rice and lentils together, some do not. However it’s made, though, it’s usually extremely delicious, filling, and very inexpensive. So, in other words, it’s definitely a budget byte! The version I finally settled on is as close to Serop’s as I can get. 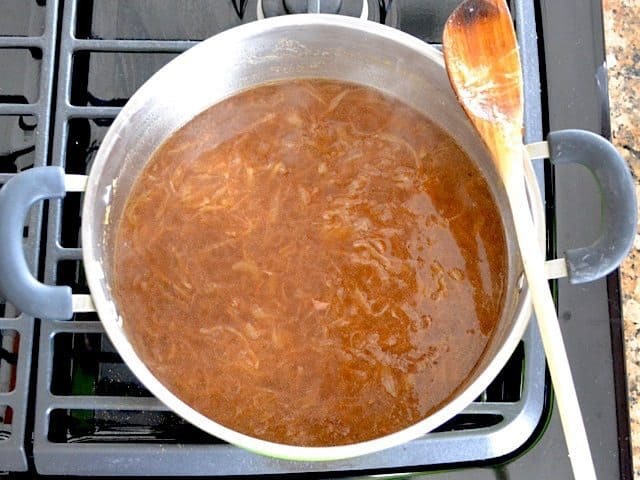 It has plenty of caramelized onions to give it a deep, rich flavor, vegetable broth to make the flavor a little more complex, and a healthy dose of aromatic spices to keep things interesting. This recipe makes a big batch of about 6 cups, but this recipe will freeze very well, so any leftovers can be saved for later. I’ve been eating mine plain in a bowl, but it goes great with sautéed greens, roasted vegetables, or even topped with a fried egg. It’s kind of one of those all-purpose dishes that can be eaten at almost every meal. No wonder it’s been around so long! 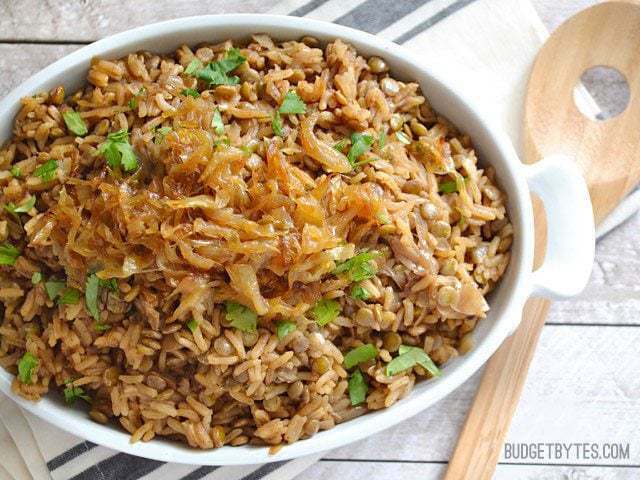 This recipe starts with caramelized onions, which lend a lot of flavor to the final pilaf. They take a long time to make, but are well worth it. 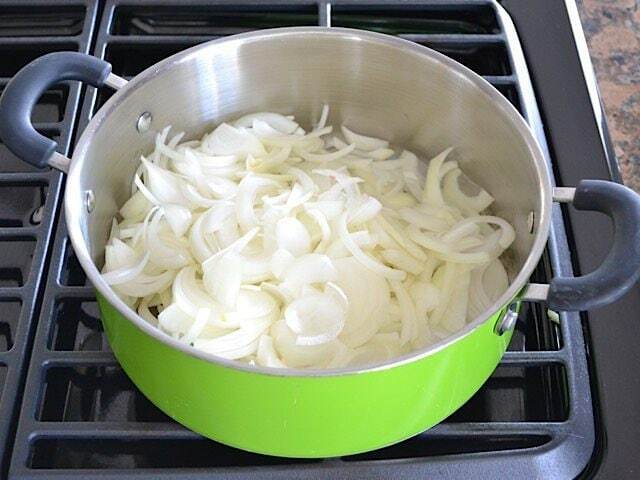 Begin by thinly slicing four yellow onions and adding them to a large pot with 2 Tbsp olive oil. Cook the onions over low heat, stirring frequently for one hour. You can stir less frequently at first, but will need to keep a closer eye towards the end. I did chores around the house during the first part, remembering to walk back into the kitchen every few minutes to stir. After an hour or so, they should be deep golden brown, sticky, and caramelized. If you don’t like the stringy texture of caramelized onions, you can dice them instead. They will probably cook a little faster when diced and will blend into the pilaf a little better. 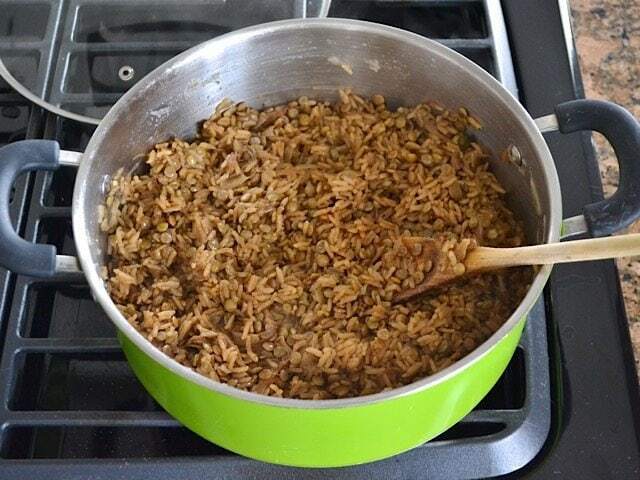 Remove half of the onions and set them aside to top the pilaf later. 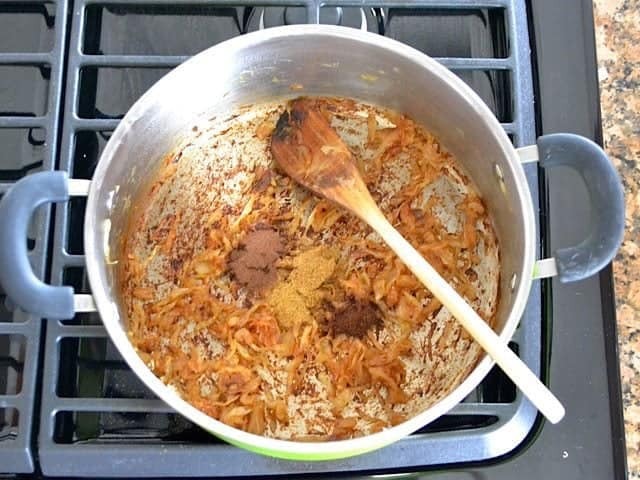 Add 1 tsp cumin, 1 tsp allspice, and 1/4 tsp ground cloves to the pot. Sauté the spices with the remaining onions for about a minute. This toasts the spices slightly, which enhances their flavor. Add 2.5 cups of vegetable broth to the pot and stir to dissolve any browned bits off the bottom. 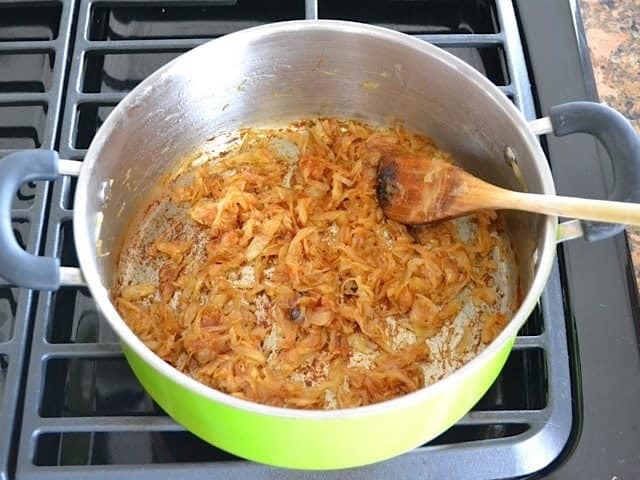 All that browned onion sugar will help give a lot of flavor to the Mujaddara. 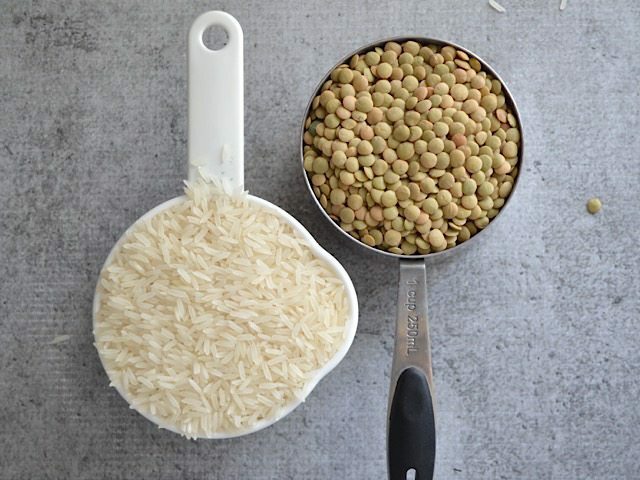 Add one cup of long grain white rice and one cup of brown lentils to the pot. I used jasmine rice because it’s my favorite, but you can use plain white rice, if desired. You’ll want to use brown lentils and not French or “green” lentils, because those take twice as long to cook as brown lentils. If unsure, check the packaging to see the recommended cooking time. It should be 20-30 minutes. Add the rice and lentils to the pot, place a lid on top, then turn the heat up to high. Let the pot come to a full boil. Once it reaches a boil, turn it down to low heat and let it simmer for 30 minutes. After 30 minutes, turn the heat off and let it rest with the lid in place for 10 more minutes. After the ten minute rest, you’ll have this (see photo above). Fluff it up with a spoon or fork (looks more appetizing now, for sure). The rice and lentils should have absorbed all the broth and be soft and tender all the way through. Top the Mujaddara with the reserved caramelized onions and serve! YUM. 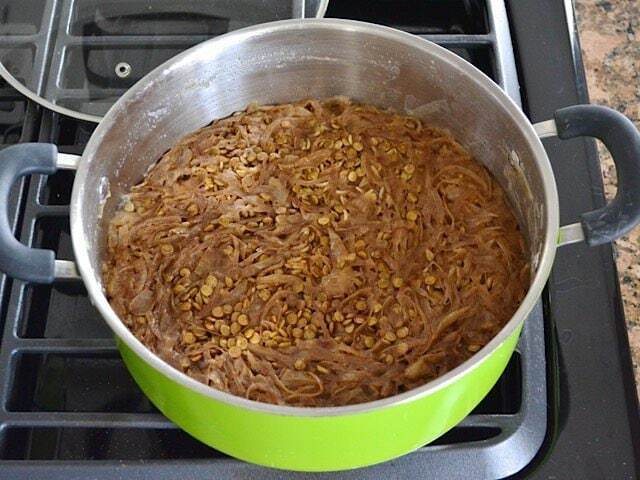 I’m Lebanese and this is totally different than any Mujaddara recipes that my family or community has ever made. Mujaddara is usually a soup, or at least stew texture not dry like this. Nice try but no cigar. Rhukaya, is there another recipe you could recommend? I’m interested in trying this dish but I’ve never had it so it’s hard to find a recipe that looks good. Thanks! I make no claims to being Lebanese, however I did attend a church that was predominantly composed of families with Syrian and/or Lebanese heritage for 5 or so years. Every family that ever brought Mujuddara in for church dinners was more like this, not a soup or stew, no liquid was left in the dish. Their versions typically though didn’t just have caramelized onions on top, rather almost blackened and crispy onions, though just how blackened and crispy was dependent on exactly which family made it. And for some of the people those blackened onions, with their almost burnt flavor, was the very best part. Not sure how they made theirs though, I moved away from the area a few years back. I’m also Lebanese, and Mujaddara is similar to this in texture, but I’m seeing a couple of missing spices. My family also adds cinnamon and ground caraway. Finally got around to making this after years of eyeing it up, and I’m so glad I did! A perfect adventure for a weekend afternoon. This was excellent! So flavorful, simple, and cheap to make. Wow—this was absolutely delicious!!! It turned out perfectly even though I had green lentils instead of brown. I just soaked them in hot water while the onions were caramelizing. This is such a cozy, comforting meal I can see myself making all winter long. So inexpensive and full of nutrients, too. I added 1/4 tsp cayenne powder but otherwise followed the recipe to the letter. Perfection!!! Thank you! Isnt cooking the rice for 30 mins too long? If it were by itself it would probably be too long. It cooks a little differently when it’s with all the other ingredients. That being said, some people have had great results with this recipe, some have not been satisfied with how the rice turned out. I made this with brown jasmine rice because I didn’t have white rice. The cooking time had to be extended but it was tasty.. thanks. I cooked this dish today and it was DELICIOUS! Thank you for sharing this. I altered the recipe because I am cooking only for myself, and it came out perfectly. I ate it with a sautéed kale and had a satisfying, full meal! I made this today and it was delicious. so this may be a really stupid question, but is there anything I can substitute for the onions? or is that just not possible with this dish? it looks yummy, but I’m allergic to onions. While you can definitely make this without the caramelized onions, I would say that they are the highlight of the dish. I’m not sure there is anything that you could use in their place that is similar. I wonder if leeks would work well to replace the onions. Or if leeks are too closely related to onions, would you be allergic to those too? Thinly sliced cabbage would be a different taste, but sounds good. You could also try caramelizing finely sliced fennel bulbs. They are so delicious. Absolutely delicious! Although it does take time, it is actually very simple to make. This dish has such a unique flavor and I love how cheap it is. What would go well with this dish? This was delicious! I used my Instant Pot. We are it for a couple days. My daughter requested a bigger amount this week for easy lunch. Home run, Beth! When you say you made it in your Instant Pot, can you tell me more? I also was thinking about making it in my IP, but wasn’t sure about timing. Did you still cook the onions for an hour on the saute function? And how long did you cook the rice/lentils for? Thank you for any info you have! I would love more details on how you converted this for your IP. 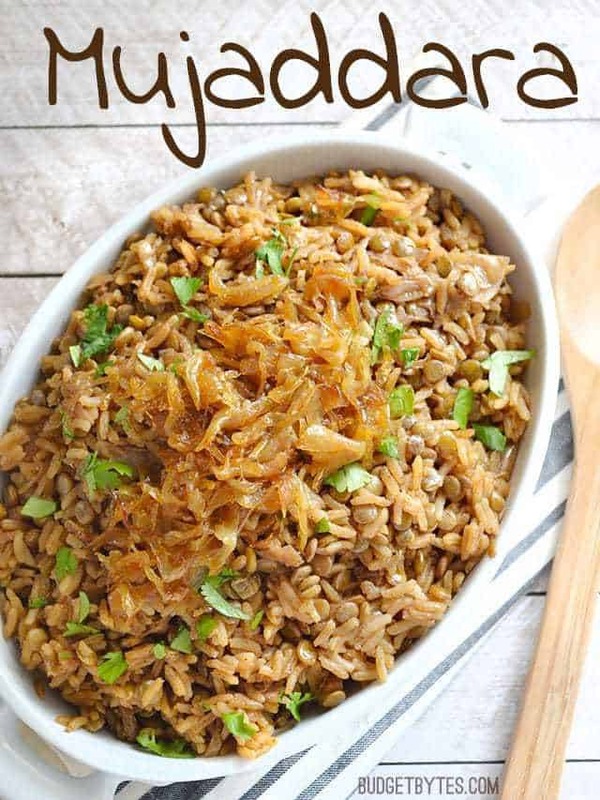 I’m a new IP owner and have loved Mujadarra for years! So you think this could be made in the Instant Pot? I think someone else mentioned that they did it in an IP, but I don’t know what setting would be best. Smear on opened PITA with Lebanese salad. Roll it up. Mujaddara sandwich…yum.